Fork Brace Instructions - AdventureTech, LLC. The brace comes with both halves bolted together with four bolts, two 35mm and two 25mm. 1. Remove the bolts and separate the front and back halves. 2. Place the front piece of the brace (the larger piece) in place by sliding it down over the fork tubes. Note: The brace is exactly the size necessary to fit between the tubes. It should be slid down over both tubes evenly at the same time. 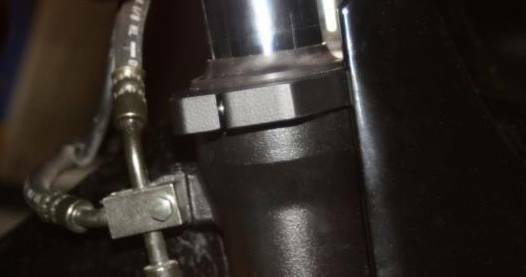 Although not usually necessary, loosening the front axle pinch bolt eases installation and ensures the front forks are parallel. Be sure to retighten the pinch bolt before riding. 3. Slide the back half into place being mindful of the brake hoses. fender. Refer to the pictures above. Note: It's very important to tighten the two inside bolts first, before tightening the outside bolts. 5. Insert the 25 mm bolts in the outer holes and hand tighten. Note: There will be a gap between the fork brace pieces on the outside. The gap allows the brace to tighten on the fork tubes. Do not try to "close the gap" by over torqueing the bolts. 6. Hand tight is good for the bolts. If you really want to use a torque wrench, be careful. Do not exceed 11 foot pounds. Use a torque wrench accurate for these light torque values. A regular half inch torque wrench is not likely to be accurate at these low levels. I don't use it myself, but temporary loctite is OK.